The Holy Grail of research engineers is really a combination of world-class results and world-welcomed products, and this holds true in the field of robotics. In the past decade, however, the great number of papers published has led to industrially successful outcomes only a handful of times. Two such successes are the SCARA robot and the Segway personal transporter. The SCARA robot, developed by Yamanashi University and 13 firms from 1978 to 1981 now has over 35% of the world market share of industrial robots. It was inducted into the Robot Hall of the Fame at Carnegie Mellon University in 2006, next to the world’s first industrial robot, Unimation Inc.’s Unimate (USA). Segway vehicles, manufactured by DEKA (USA), apply the principle and mechanisms of the parallel bicycle, developed at the University of Electro-Communications from 1986 to 1989. The parallel bicycle, invented as an alternative to biped robots, went into recent use as a two-wheeled mobile transporter for humanoids. The author was involved in developing both the SCARA robot and the parallel bicycle, and is thus well aware of their potential social contributions, concepts, “big moment” of ideas, development, and evolution. Such leading original achievements are historically valuable and contribute significantly to convenience in daily living. The many other robots introduced in this book have the potential to attract worldwide attentions and will serve as inspirations to global technology in the future. The author also discusses what research engineers need to do to achieve original research outcome and suggests ways to help young people develop curiosity and creativity. 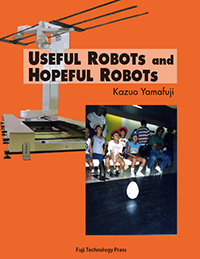 It includes mainly the author’s boyhood experiences and highlights of his university research and development works in robotics. In exploring the 21st century world of mega-competition in science and technology, this book presents a wealth of ideas and achievements inspiring technical and developmental originality, and as such, is expected to aid young researchers in original research worldwide. There are some errata in this book.